The 155mm M777 Howitzer is the core strategic artillery system of the future, soon to become the NATO standard weapon in its class. The gun is already in high demand from nations worldwide, recognising the unique structure and capability of providing artillery support to early entry and rapid reaction forces. A revolutionary gun system meeting the demands of today's security environment. The 155 mm Lightweight Howitzer was originally developed as a private venture. Its origins can be traced back to the early 1980s when Vickers Shipbuilding and Engineering Limited (VSEL) (which today is BAE Systems Land Systems) originally perceived a potential market for a lightweight 155 mm towed howitzer. In the spring of 1987 the project definition was completed. Its objective was to have a weapon with the same range as the US Army's M198 155 mm towed howitzer but weighing no more than 4,000 kg. The current M198 weighs 7,163 kg which limits its air mobility; it can only be carried by two helicopters, the US Army Boeing CH-47 or the US Marine Corps Sikorsky CH-53. The US Army was fully briefed on the system and agreed that if the company built a prototype of the system with its own money it would carry out a complete evaluation of the system. 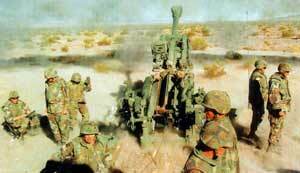 In September 1987, the main board gave approval to build two prototypes of the system, which is today called the 155 mm Lightweight Howitzer. Both were completed in late 1989. The complete upper part of the weapon was test fired at Eskmeals in June 1989 with a total of 50 rounds being fired at all elevations, 12 of which were zone 8S (top charge). Although the weapon was originally targeted at the US Army, the US Marine Corps took the initiative as it was looking for a lightweight 155 mm system to replace all current 105 mm and 155 mm towed artillery systems. Following its unveiling at the 1989 Association of the United States Army Exhibition in Washington DC, one of the two prototypes went to the US for early evaluation. This evaluation, under the supervision of the US Army Armament Research and Development Command on behalf of the US Marine Corps, took place in three phases through to 1990. It also completed limited land mobility trials and airlift certification in single and split mode. At the end of Phase 1 the system was awarded limited live crew clearance for the US. Phase 2 was conducted at the US Marine Corps Base at Camp Lejeune, North Carolina and at the Naval Base at Little Creek, Virginia. During Phase 2 the system achieved a single lift with the UH-60L Black Hawk helicopter. Amphibious trials were carried out successfully at Little Creek. The final phase took place at Aberdeen Proving Ground, Maryland where the system carried out successful climatic chamber firings at temperatures ranging from -25 to +145°C. These climatic firings were followed by air transportability (split lift) trials and 622 km of land mobility trials on test tracks ranging from trails to Belgian blocks and included wading to a depth of 1.5 m.
The US then had a competition which involved extensive tests with the 155 mm Lightweight Howitzer and the Light Towed Howitzer developed at the then Royal Ordnance facility at Nottingham. In the end the former was selected. For the US programme, Textron Marine & Land Systems was selected to be the prime contractor with the then Vickers Shipbuilding and Engineering Limited being the main sub-contractor. By 1998 it was clear that the US programme was running into problems and early in 1999 the now BAE Systems Land Systems assumed the role of prime contractor of the troubled XM777 towed artillery system from its team member Textron Marine & Land Systems. This company no longer has any involvement with the programme. In September 2000, following an extensive competition, BAE Systems Land Systems finally selected its core industrial supplier base for US production of the XM777 155 mm weapon. The body assembly is manufactured by HydroMill Inc of Chatsworth, California, stabilisers, spades and trails are supplied by Major Tool and Machining Inc of Indianapolis, Indiana, the breech operating load tray system is provided by Rock Island Arsenal, Rock Island, Illinois, with titanium being supplied by RTI International Metals Inc of Niles, Ohio. In late 2002, BAE Systems Land Systems was awarded a USD135 million contract by the US DoD for the Low Rate Initial Production (LRIP) of the M777 following its type classification. Under the initial phase of the LRIP contract, BAE Systems Land Systems has built 94 M777s for the US Marine Corps, with first weapons delivered in February 2003 from the company's Hattiesburg, Mississippi facility. The M777, which while under development was called the XM777, will replace the current 155 mm M198 towed howitzer which weighs 7,163 kg. Under the five-year Engineering and Manufacturing Development (EMD) contract a total of nine systems were built at the BAE Systems Land Systems facility at Barrow-in-Furness. These have underwent an extensive series of tests in the US during which more than 10,000 rounds of ammunition have been fired. The nine EMD guns were followed by two preproduction (PP1 and PP2) guns from the US production line to test and validate the US production base. According to BAE Systems Land Systems, about 70 per cent of the M777 is made in the US, including the 155 mm/39 calibre barrel, which is provided by Watervliet Arsenal. Barrow-in-Furness manufacture the upper cradle as well as the suspension and running gear. 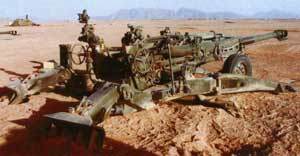 In March 2005, BAE Systems Land Systems was awarded a contract worth USD834 million covering the supply of 495 M777A1 155 mm/39 calibre lightweight howitzers for the US Army and Marine Corps. The 495 M777A1 will be delivered over a four-year period starting in July 2006 and running through to October 2009. The US Army is expected to take delivery of 233 systems and the US Marine Corps 262, as the replacement for the current in-service and much heavier 155 mm M198 towed howitzer. Marines from the 3rd Battalion, 11th Marine Regiment stationed at Twentynine Palms, California, were the first unit to receive the M777. Early in 2002, BAE Systems Land Systems was awarded a USD41 million contract by the DoD for the development of the M777E1 over a three-year period. Under this contract, BAE Systems Land Systems integrated the General Dynamics Armament and Technical Products Towed Artillery Digitization/Digital Fire-Control System (TAD/DFCS) onto the weapon. BAE Systems Land Systems is prime contractor, with General Dynamics being main subcontractor. The M777E1 was Type Classified as the M777A1 in January 2007. The M777A2 is the M777A1 modified to fire the Raytheon 155 mm Excalibur precision guided munition. This has a maximum range of 40 km and is accurate to 10 m.
The M777A2 also has a hard wired fuze setter which is located near the assistant gunner's position and used to programme the Excalibur fuze prior to loading. Excalibur can also be fired by other towed and self-propelled artillery systems with a modified fire control system. US Army M777A1s will be fitted with TAD/DFCS and this will also be back fitted to the US Marine Corps LRIP M777, which will then be designated the M777A1. Installation of the TAD/DFCS will enable the M777A1 to fire the Raytheon Excalibur precision guided projectile out to a range of 40 km with an accuracy of 10 m.
Late in 2005 Canada took delivery of the six M777 155 mm lightweight towed artillery weapons and these were issued to the 1st Regiment Royal Canadian Horse Artillery. These were supplied to Canada by the US Marine Corps through the US Foreign Military Sales (FMS) programme from the BAE Systems Land Systems production line at Hattiesburg in the US. In early 2006 these were deployed by Canada to Afghanistan in support of operation Archer. This was the first operational deployment of the M777. Since then an additional six weapons have been supplied which brings the total up to 12. As of early 2008 six of these were in Canada and six in Afghanistan. The Canadian Army has a requirement for another 34 155 mm lightweight howitzers. 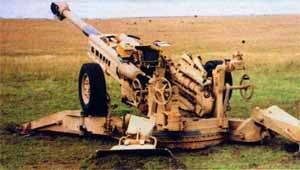 Canada was the first country to deploy the M777 in action. The Canadian M777 are fitted with the Selex Sensors and Airborne Sensors Laser Inertial Artillery Pointing System (LINAPS). LINAPS has been installed on all operational BAE Systems Land Systems 105 mm L118 Light Guns of the Royal Artillery (RA) which proved highly effect in the Second Gulf campaign. By early 2008, production of the M777A2 was running at 18 units a month and production will continue to at least late 2009. The US is expected to procure another 43 for the Marine Corps and 95 for the Army. Although the M777 uses advanced materials in its construction, it is claimed to be simple to operate and maintain under field conditions. 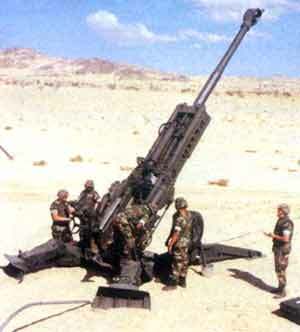 The 155 mm/39 calibre ordnance (M776E2) is essentially that of the M284 barrel used by the US Army's M109A6 Paladin fitted with the M199 muzzle brake as used by the current towed M198 howitzer but modified to take a towing eye. The conventional screw breech is hydraulically operated and opens vertically. For this application the breech of the 155 mm M776E2 cannon has the screw breech turned 90° to allow vertical operation between the cradle tubes. A derivative of the M49 firing mechanism is mounted to the primer feed mechanism. The magazine has the capacity for 10 M82 primers. The 155 mm/39 calibre ordnance can be elevated to 1,275 mils (71°) and depressed to -43 mils (3°). Top traverse is 400 mils (23°) left and right. To keep the weight down, extensive use has been made of extruded titanium alloy fabrications, designed by BAE Systems Land Systems, but subcontracted to other companies, as well as efficient structural design. Some of the parts perform two functions, for example the Horstman Defence Systems designed hydropneumatic suspension system also operates as a hydraulic jack. The elevating mass comprises two sub-assemblies, the cradle and the 155 mm/39 calibre cannon tube assembly. The cradle includes four extruded titanium tubes, an accumulator, two recoil cylinders and balancing gear. The cannon tube assembly includes the cannon tube, muzzle brake, towing eye, primer feed mechanism and screw breech. The carriage comprises two sub-assemblies, the body and the saddle. The body includes two forward stabilisers and two split trails fitted with self-digging spades and dampers. Mounted on either side of the body is a hydrogas suspension unit fitted with stub axle and aluminium rimmed road wheels. A small hydraulic hand pump is installed at each wheel station to raise and lower the system into and out of action. A centrepost on the body receives the saddle, and a rack segment attached to the rear of the body engages with the saddle-mounted traverse gearbox enabling the saddle to be rotated through 400 mils left and right. The saddle is fitted with a yoke-mounted roll screw and nut elevation gear actuated by handwheels on either side of the saddle. In the baseline model, a universal sight mount is fitted on the left side but provision is made for a second sight on the right side for customers requiring a two-sight system. A loading tray is provided to the rear of the breech, which is opened automatically. BAE Systems Land Systems is considering future options, which could include a flick rammer, but the aim for the present is to keep the weapon as simple as possible. When in the travelling configuration it is towed by its muzzle in a similar manner to the Russian 122 mm D-30 howitzer by any truck with a 2 tonne capacity (or greater) fitted with air-operated brakes. It can be internally transported in a number of transport aircraft including the C-130, C-141, C-5 and C-160 Transall. It can also be transported slung under the UH-60L/UH-60M Black Hawk and CH-53E/CH-53D helicopters and the MV-22 Osprey. BAE Systems Land Systems has proposed a complete family of 155 mm weapons based on the M777, as well as the 155 mm M777 with 39 calibre barrel now in production in the US. These include a direct support weapon with a 26 or 30 calibre barrel which would have maximum ranges of 19 and 22 km and 45/47/52 calibre weapons with a maximum range of over 40 km. This was developed to the prototype stage but is no longer marketed. For trials purposes the system has been fitted and tested with the now Selex Sensors and Airborne Systems Laser Inertial Artillery Pointing System (LINAPS). This is already installed on all L118 Light Guns of the UK Royal Artillery. LINAPS is also installed in the M777 supplied to Canada. This was developed to meet the British Army requirements for a Lightweight Mobile Artillery Weapon System (Gun) and based on a 8 × 6 chassis. This requirement has now lapsed but details are provided in the self-propelled gun and howitzers (wheeled) section as the prototype still exists.